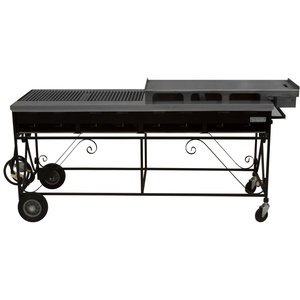 Whether you’re hosting a barbecue at your vacation rental or organizing a community event, Breakaway has the outdoor cooking equipment you need for your next function. Grill rentals are available in Cape Cod for events of all kinds. Our LazyMan Grill Rentals are perfect for homes without permanent grills or for those nights the entire family is coming for dinner. Learn more about our grilling options below. If you have a private function and need a little more grilling power than your current back yard grill can handle, then a LazyMan grill rental is for you. For $175, we will deliver your grill, typically the day before the event complete with a filled 30 lb tank (one size larger than the standard grill tank), and a complimentary lighter and cleaning brush. We then pick it up typically the day after your event. Same-day delivery and/or pickup may also be available depending on event timing and availability of delivery drivers. There is a $25 deposit required that will be refunded if the grill is cleaned prior to its return to Breakaway. These book up fast! Contact us with any questions or to make a rental reservation for your event.